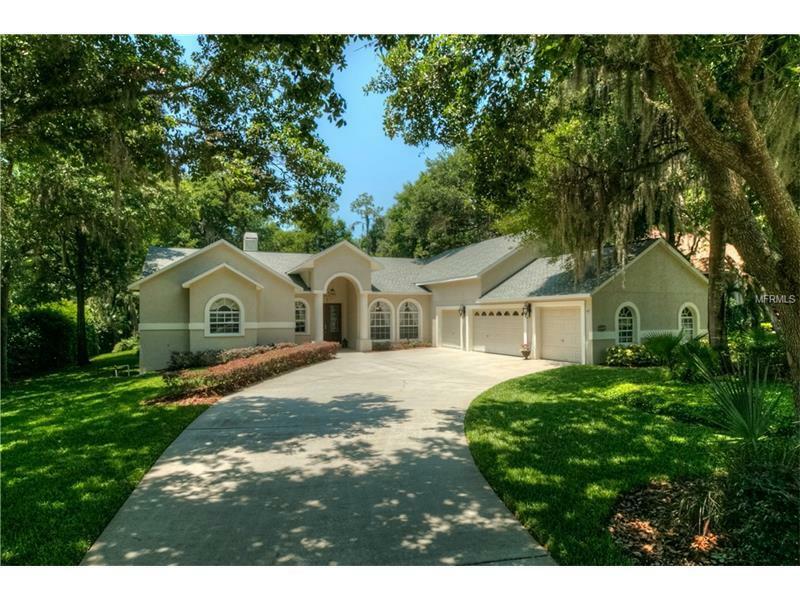 Lovely home located in the 'Reserve' area of Fish Hawk Trails and sitting on a lush, half acre, private conservation lot. This home is true to it's floorplan name, 'The Grand Entertainer!' Impress your family and friends when gathering in this spacious and comfortable home. As you approach the home, you will notice THE NEW ROOF and sweeping drive to the 4.5 car garage. Enter the home through double leaded glass doors with expansive views of formal areas and outdoor living space with a conservation backdrop. Featuring a very flexible floor plan that is adaptable to the way you live. There are 3 secondary bedrooms, along with an office and two additional large rooms that can also serve as bedrooms, one upstairs and one down. One of them is currently being used as a media room with projector and screen that convey with the home. The kitchen is a chef's delight with lots of granite counter tops, wood cabinets, center island and adjacent wet bar with wine fridge. The kitchen opens to the spacious but cozy family room with fireplace. The master suite is privately located at one end of the home and overlooks the pool area, featuring a fireplace, crown molding, super sized closet and luxury bath with dual sinks and jetted garden tub. Off the master suite is a private office. The outdoor living space features a sparkling pool and spa with brick pavers, outdoor kitchen and sundeck with the utmost in privacy. Located in a 24 hour gated guarded community with great schools. Come see it today!